Early 60’s … East London … Cream, Elvis, Leadbelly. The beginnings of a passion for rhythms on percussion and lyrics on guitar. Up in the attic in Walthamstow … Berry, Dylan, Tull, teddy boys, mods ‘n’ rockers, The Stones, The Beatles & … these were the influences shaping the life and music of Richie Pavledis. Richie took his burgeoning talents to Western Australia whilst in his teens, and began honing his skills with a number of local bands including Prayer Wheel, Buckshot, Slave and Barrelhouse. The 70’s gave way to the 80’s, by which time Richie had worked the blues circuit with the likes of the Dave Hole band, and the country scene with Alby Pool’s No City Limits. Finally Richie found the blend of styles that suited his eclectic foundations and wide ranging talents with Rick Steel and Marc Gordon in The Hot Biscuit Band. Whilst a great many bands have benefited from Richie’s rhythmic interpretations and unique vocal style, there has always been a deep yearning to express his thoughts and feelings through his own compositions. So in the late 90’s Richie began working on his debut album “Long Distance Dream” and with the help of Tony Shergold they put together a splendid CD featuring some of Western Australia’s finest musicians. Dave Clark, Bob Patient, Marc Gordon, Tony Shergold, Jean Guy and John Burn. In 2002 Richie recorded and released his second CD. “Minstrel” is a work of art, weaving together country, folk, and blues with acoustic melodies that lift the spirit and ease the blues. Richie on percussion, guitars, harmonica and vocals put together a beautiful collection of songs. He breathes spirituality. 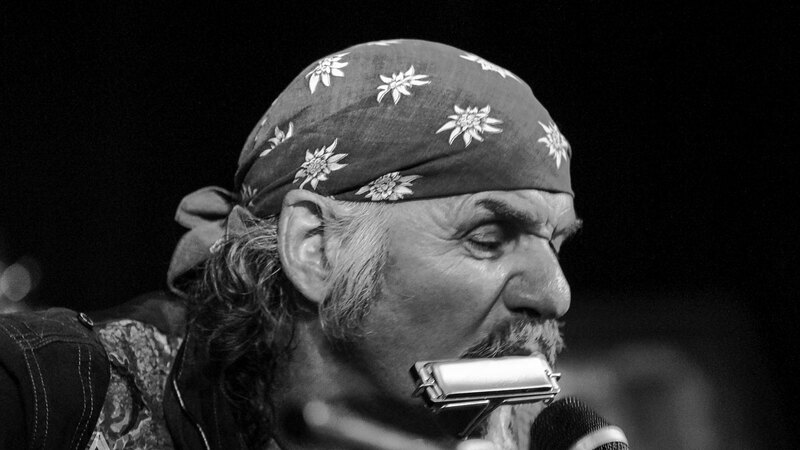 The idea of recording this CD came as a result of winning the West Australian WAMI 2001 Award, given to Richie for Best Blues Song, “Long Distance Dream”, the title track of his first album. On his third album “Live at the Charles” the home of the Perth Blues Club, Richie recorded a selection of blues songs by some of his favourite artists Leadbelly, Robert Johnson and Willie Dixon to name a few. He released this album in Switzerland in 2004. There were however three of his compositions on this CD. In March 2006 Richie released “Holly” his 4th CD which he recorded with Paul Marvin. This is a warm collection of songs. The album includes an old Cat Stevens song “Father and Son” and his arrangement of the classic “Ghost riders in the sky”. “Holly” was pressed in Switzerland and has been quite popular. Switzerland has become his second home. In June 2007, Richie and Gaby were back in OZ and recorded album number five “Movin’ On” a collection of 12 new songs. Recorded by James Hewgill the master sound man and the wonderfully talented bass player Gandharva. This album was released on 21st July 2007. There it is; intensity, passion and integrity flow through his songs and make them live. Hearing the music is like having a conversation with Richie. The songs relate to various qualities, but they all share one central theme; we’re alive. And that joins us somehow; in the great spirituality of our world. The latest album Hope Street has been recorded and mixed at James Hewgill Music, Perth Western Australia. Hope Street is a cross genre featuring rock, reggae and blues and has been released March 2014. With all his albums, Richie has stepped out in his own right. His unique vocal and instrumental skill, imagination and a willingness to express from the heart has given us excellent CD’s from a local treasure.